Let’s get the run-down from beat-reporter Erik Erlendsson of the Tampa Tribune…. “June 23 – Lightning owners Oren Koules and Len Barrie are introduced at a press conference in Tampa, where they first announce a deal in principle is in place with Vinny Prospal and that they plan to be “shockingly aggressive’’ in free agency (certainly some foreshadow). “June 24 – Barry Melrose is introduced as the new head coach in a press conference filled with plenty of glitz and promise that also includes the announcement of Rick Tocchet and Wes Walz as part of the staff. “June 25 – Word begins to circulate that Vinny Lecavalier is on the verge of signing a contract extension worth $77 million over nine years that is later confirmed by team sources, although details are still being worked out. “June 26 – Overall No. 1 pick Steven Stamkos comes to town for his introduction to the Tampa area and meets with the local media. Meanwhile, owners Koules and Barrie head out of town for a quiet weekend before the start of free agency. “June 27 – All is quiet!!!! “June 28 – Tampa Bay acquires the negotiating rights to pending free agents Ryan Malone and Gary Roberts from Pittsburgh and immediately begins discussing contracts for both players. “June 29 – Word begins to circulate that the Lightning have come to terms on deals for both Malone and Roberts, with Malone expected to sign a seven-year deal worth $31.5 million while Roberts is expected to sign a one-year, incentive laden deal that could pay him up to $2 million. As of right now, 6:30-ish pm, Tampa Bay today has signed Prospal, Roberts, and acquired defenseman Janne Niskala from the Philadelphia Flyers. There are rumors that the contract from Malone is pretty close to being complete, so we should hear about that soon. Tampa’s people are talking to Rolston’s people, so at least there’s some communicating going on. And last, but not least, we’re all waiting with baited breath for Lecavalier’s deal to be official. Of course, there are rumors that the team is shopping Dan Boyle (who has a no-trade clause in his contract) & that Tampa Bay might be looking for a goaltender to back up Mike Smith. So keep an eye out for all of that. Whew! They’ve been some busy boys. Who says the off-season is boring, huh? And this is all happening before tomorrow – July 1st and the beginning of free agency – so who knows what wackiness is coming next! I really want to see next season’s schedule now. Adding some intrigue to the story, last week the Lightning hired former Penguins' player Greg Malone as their head pro scout. Greg Malone is the father of Ryan. The Minnesota Wild traded forward Brian Rolston's rights to the Tampa Bay Lightning in exchange for a conditional draft pick in either the 2009 or 2010 NHL Entry Draft. The Wild will get a selection in either the 2009 or 2010 draft. The pick will depend on whether Tampa Bay re-signs Rolston before they know what pick Minnesota will get in the deal. The 25-year-old Flint, Michigan native has 12 NHL seasons under his belt with stints in New Jersey, Colorado, Boston and Minnesota. Tampa acquired the rights of Gary Roberts & Ryan Malone yesterday. I hope that they’ll be able to sign these two. I think that they’ll be good additions to the Lightning. Especially since they did so well during playoffs with Pittsburgh. Although, it does make me wonder why everyone’s bailing ship on Pittsburgh. Do they have a lot of free agents to sign? Or is it something else? They’ll be an interesting team to watch this coming season. Finally, Lecavalier’s rumored to be signing a 9-year deal with Tampa. It’s great for the Lightning that he wants to stay, particularly for so long. However, I have just one question. Why 9 years? Why not 10? Or why not until he’s 35 or something? 9 years seems like an odd number to me. I’d like to know what the rationale is for that. Just curious, more than anything. TAMPA BAY – Barry Melrose has been named thesixth head coach of the Tampa Bay Lightning, it was announced by owners Oren Koules and Len Barrie. A winner at every level he has coached, Melrose spent three seasons (1992-95) as the head coach in Los Angeles, leading the Kings to the Stanley Cup Finals for the first time in 1993. Melrose, 51, began his coaching career in 1987 when he led the Western Hockey League’s Medicine Hat Tigers to a 44-22-6 record and the Memorial Cup title. Known for his no-nonsense approach and ability to develop young players, he also coached the Seattle Thunderbirds for the 1988-89 season and the Adirondack Red Wings of the American Hockey League for three seasons (1989-92). Melrose guided the Red Wings to the Calder Cup championship in 1991. He also served as the team’s general manager during his final two seasons. During his 11 years as a player, Melrose played 300 career games as a defenseman in the NHL with Winnipeg, Toronto and Detroit (1979-86), recording 10 goals, 23 assists and 728 penalty minutes. He skated in seven Stanley Cup playoff games with the Toronto Maple Leafs, assisting on two goals and recording 38 penalty minutes. He also played three seasons with Cincinnati in the WHA (1976-79). Melrose most recently served as NHL studio analyst for ESPN and ESPN2. Melrose appeared regularly on ESPN2’s NHL 2Night, the network’s NHL news and highlights program. He also provided reports for SportsCenter, appeared on ESPN Radio and was a regular contributor to ESPN The Magazine. From 1996 to 2002, Melrose also called regular-season and playoff games for ESPN and ABC Sports (2000-02). From 2003 to 2004, he provided studio analysis for ABC Sports’ NHL telecasts. In January 2004, Melrose became part owner of the Adirondack Frostbite of the United Hockey League. Born July 15, 1956 in Kelvington, Saskatchewan, Melrose was sworn in as a U.S. citizen in 1998. 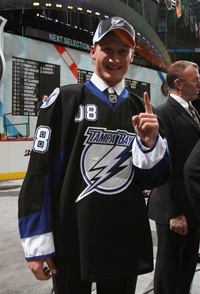 TAMPA BAY – The Tampa Bay Lightning have selected Steven Stamkos of the Ontario Hockey League’s Sarnia Sting with the first overall pick at the 2008 NHL Entry Draft in Ottawa. "We are extremely pleased to have Steven Stamkos in our organization," Executive Vice President and General Manager Jay Feaster said. "He is the consensus number one pick for a reason - gifted offensively, committed defensively. Great hockey sense and incredible maturity set him on top of this draft class. He will look very good in a Lightning uniform for many years." "This is the ultimate dream come true for me," Stamkos said. "I’m very excited to join the Tampa Bay Lightning." Stamkos, a 5-foot-11, 176-pound native of Markham, Ontario, was rated as the consensus top overall pick in this year’s draft, taking place today and tomorrow at Scotiabank Place. Stamkos ranked second in the OHL last season with 58 goals and fifth in points with 197 in 61 games with Sarnia. His nine game-winning goals were tied for second in the OHL, his 23 power-play goals were third and his five shorthanded goals ranked tied for fifth. He scored 11 goals, including four in Game 4 of Sarnia’s first-round match-up with the Windsor Spitfires, in nine games during the 2008 OHL Playoffs. The 18-year-old was named the OHL’s Player of the Month for February after recording 13 goals and 22 points in 13 games. He was also recognized as the best stick-handler and as having the best shot in the OHL’s annual coaches poll. The center was one of two players born in 1990 named to Canada’s 2008 World Junior Championship team. He recorded a goal and six points in his first appearance at the tournament as Canada went on to capture the gold medal. Stamkos played in 124 games during his two-season OHL career. He recorded 100 goals and 197 points during his time with Sarnia, including 14 goals and 17 points in 13 career playoff games. In 2006-07 he was the runner-up for the OHL’s Rookie of the Year award behind Patrick Kane of the Chicago Blackhawks. He was also honored with the Bobby Smith Trophy as the OHL’s scholastic player of the year. The award is given annually to the player who best combines high standards of play and academic excellence. Before joining the Sting, Stamkos recorded 105 goals and 197 points in 67 games with the Markham Waxers AAA midget team in 2005. Sarnia drafted Stamkos first overall in the 2006 OHL Priority Draft. The Lightning won the NHL Draft Drawing and retained the first overall pick in this year’s draft on April 7, 2008 in Toronto. They have seven selections remaining in this year’s draft, including five in the sixth and seventh rounds. Stamkos is the third player in franchise history to be chosen first overall. 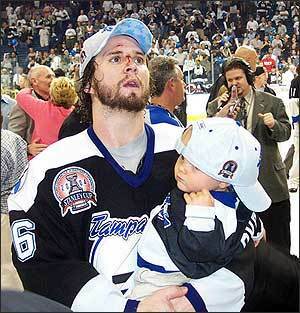 Tampa Bay took Roman Hamrlik with the first pick in 1992 and Vincent Lecavalier with the top pick in 1998. TAMPA BAY – Tampa Bay Lightning center Vincent Lecavalier has been named the winner of the 2008 King Clancy Memorial Trophy. Lecavalier was presented the trophy at the NHL Awards tonight in Toronto. The King Clancy Memorial Trophy is awarded annually to the National Hockey League player who best exemplifies leadership qualities on and off the ice and who has made a significant humanitarian contribution in his community. The winner is chosen by a special panel of representatives from the Professional Hockey Writers' Association and the NHL Broadcasters' Association. Lecavalier has made community giving and charitable work a part of his daily life since joining the Lightning a decade ago. In October of 2007, Lecavalier made his largest commitment yet to the Tampa Bay community, announcing a $3 million pledge to construct the Vincent Lecavalier Pediatric Cancer and Blood Disorders Center at All Children's Hospital in St. Petersburg. TAMPA BAY – Tampa Bay Lightning Executive Vice President and General Manager Jay Feaster announced today that John Tortorella will not return next season as the team’s head coach. Tortorella has one season remaining on his contract. “At the same time, we need to look to the future of the both the club and the organization, and we must make decisions with the future in mind. John was entering the final year of his contract and extending his contract was not a viable option. Having him enter and coach the season in a lame duck status was not something I was prepared to recommend to ownership.